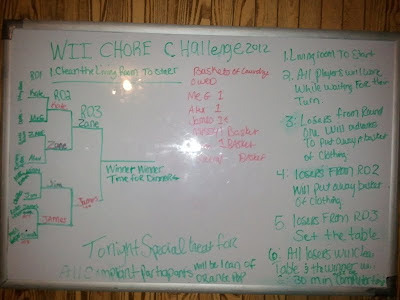 Simply Raising 8: WII chore challenge tourney and no one is perfect. WII chore challenge tourney and no one is perfect. Two things I want to share today. This weekend I decided to try something different with the kids to make chore time more fun. We have been working on getting things prepared for construction around here so there has been early spring cleaning going on. Sometimes it feels a lot like all we do is work. The construction will begin March 19th and that is not that far away. It is set to end by August 31st. Here is what I came up with. This is set up like a tournament. This is one of the things that I think is easier with a big family but could be done with a smaller family as well. In order to begin they had to all help straighten up the living room since that is where the WII is I figured that would be a great way to get that cleaned up fast. All players work while waiting for their turn. Next to each person’s name on round 1 was their chore for the day. Bathroom, Dining room, kitchen, Dishes, laundry room etc. Whatever chore they have for the day they have to work on it until it is there turn to play in the tournament. The babies were paired up with an older kid to help. (Rosie (Sierra) likes to help with dishes so I paired her with Megan. Megan is on dish duty this week because of bad behavior) if they get done with the chore they can sit on the couch and watch the others play. Round 1 If you lose your round you owe one basket of clothes to be put away. Round 2 If you lose your round you owe one basket of clothing to be put away. Round 3 all who lost the rounds set the table together. All that lost the tournament will help clear the table and the winner of the tournament will get 30 minutes of computer or WII time. As a Special bonus who all compliant participants will get a can of orange soda for a treat after clothes are ready for church for tomorrow. Guess what you’re not the only one that is not perfect? Today while at church I was talking to some other ladies who were talking about kids not getting their clothing ready till the last minute. You know when they say at 9 at night that they need jeans washed for the morning? I always feel like I am the only one that has this happens with her kids. But Guess what kids will be kids. Sometimes I feel like I have to be a better parent and things only happen to me. It helps to hear that somethings we are hard on our family for are things that are normal to others as well. What a creative way to get your kids to help out around the house! I'll have to try that. Thanks, They were asking to play it again the next day.